Game ticket price includes sales tax. Add $1 for day-of-game tickets. The ballpark is located on Coosa St. and Tallapoosa St. and is a new modern ballpark built into the historical train station. The stadium capacity is 7,000, including general admission lawn seating that is located in right-center field. The stadium offers 20 luxury suites. Six of the suites are built into the old train terminal along the first base line and the remaining 14 run along the third base line. 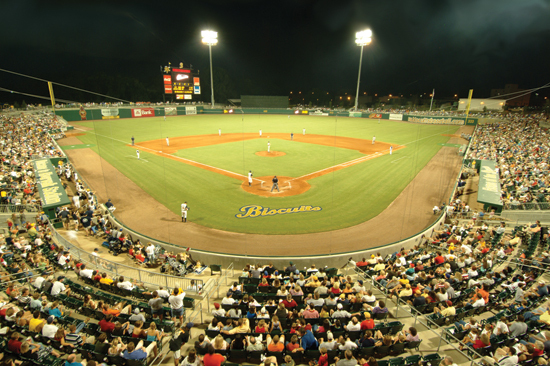 Montgomery Riverwalk Stadium offers picnic areas along the third base line and in left-center field. The picnic area in left-center field can accommodate up to 4,000 Biscuits fans. A children's playground area is located along the third base line. The stadium scoreboard is a $1 million video board with a huge LED screen capable of instant replay.